There was a father chaperoning his daughter, the Princess, to the Fine Arts National Competition, but there were no pianos on which she could practice, so he took her to a piano merchant so she could practice on the pianos there. Afterward, the father told his wife that they absolutely needed to get the Princess a grand piano. I have always wanted to do that for the Princess, but finances and space were factors that we had not been able to overcome. Once I talked with a woman whose homeschooled daughter won a full scholarship at Reinhardt University, a fairly nearby private college well known for its music program. She was advised by her teacher to get her daughter a grand piano, so they put a second mortgage on their house and they placed the full-size grand in their living room, which was said in a way that I was sure they did not have much living room left to live in. However, since her daughter won a full scholarship, she saw it as a worthwhile investment. I so very much wanted to do this too, but this conversation was a few years ago at at time that we were particularly strapped for money so I knew a grand piano for us just was not going to be happening for a long while. Still in the back of my mind, I hoped for this. Then I seriously began learning about what elements that makes a good piano, because I really did not know. (I am so thankful for the Internet at times like this.) After I felt a bit more confident about what to look for as to how it should be built, I began looking for a used baby grand with a reputable name that we could afford and fit into our living room. I was more interested in American made, however the Princess' piano teacher has a Kawai upright, which does have nice warm tones and told me that Reinhardt also just bought Kawai pianos. Of course, most people will say that a Steinway is what is mostly used in competitions here. I found an American made Mason and Hamlin baby grand on Craigslist that I felt was worth the trip to see and hear. When I called Bob Rosenfeld, I learned that he did not just have the one piano but several. He is a piano collector, of sorts, but now he has lung cancer and his wife is having serious issues with her eyes, so he is selling off his collection. He asked me a bit about my daughter's playing and said he had a piano for her, but that I probably had never heard of it. I immediate thought "Just what we need: another piano that no one has heard of." Whenever we tell people we have an Opus II upright piano, they all say that they have never heard of that brand. Even our piano technician has never seen one, except for ours. We bought it brand new at Steinway Piano Galleries in November 2005, when the Princess was four and a half years old. We call that story the Blue Note Christmas. However, I made an appointment at 10:00 a.m. on Saturday for us to see what he had. I also called my piano tuner/technician to see how much he would charge look it over and when he was available, which he was not that for that day. My husband's flight was delayed twice the night before so he did not walk into our door until 3:00 a.m. The Princess still had a cold and was coughing a lot. I still had some tummy trouble left over from whatever the antibiotic had done to my digestive tract after the periodontal surgery. None of us was in good shape, so I thought about cancelling, but we went and I reminded the Princess to not get close to the man because he did not need a cold while battling lung cancer. Before I even placed the address on my GPS, I had an idea where we had to go and knew it would take about an hour to get there. It was pretty much my stomping territory not far from the Princess' piano teacher. However, when I saw it flagged on the map, I knew exactly where it was. I have driven past that home many times taking the Princess to her piano lesson from the Home Learning Center and back again. It has had a "for sale by owner" sign up ever since I can remember in front of their pond and two fake black and white cows. I had never seen the house, even in the winter because it is well-hidden from the road by trees and bushes, but once we entered the driveway, I could see the all brick home shaded by lovely trees and how well the landscaping was done. The road curves there and the house is a bit close for my taste, but it is not seen because of the wall of greenery that keeps their home secluded from the rest of the world. Unfortunately, it is a very busy road that will probably be widened in a few more years, and the traffic is noisy at the front of the house. As I wrote previously, the first thing Mr. Rosenfeld did was take us to a large barn behind the house that had a few stables on one side, but no animals, and a cement floor. It also had several covered pianos, at least five if I am recalling that correctly. All of them were far bigger than we would have room for. He uncovered the very first one, a nine foot, 100 year old, concert grand Steinway perfectly tuned and invited the Princess to sit saying he wanted to see her play. She was impressed that the old piano played rather well and had good key action. He was rather impressed with how her hands floated over the keys and told her he knew exactly which of his pianos would be the best for her. We covered up the old Steinway and were led back to the house. In the garage, only because they had just had a water leak and part of the interior needed some work, was about five or six more pianos and he told us there were more in the house. These were smaller, baby grands and an upright or two. He led us straight to the Petrof. Since he had mentioned the Petrof when we talked on the phone, I had done some research. He had been quite honest when he told me that it was well known in Europe and used in many schools there. Petrof has been made in Czechoslovakia since 1864. These pianos are well known for their warm tone and bell-like clarity particularly on the high notes. I fell in love with Petrof as soon as I heard the first video I found online of one being played, but in person...ah! My daughter played it and my husband was already sold. A bit later I asked the Princess to play the Mason and Hamlin beside it. The Petrof looked brand new and the Mason and Hamlin looked older. The Petrof just sounded so much better: brighter, clearer, yet warm. She said she liked the Petrof the best. We were told that the Petrof's original owner was a doctor and it had only been played a few times. I asked Mr. Rosenfeld why had not played it himself and he said that his hands had been so shaky and that the cancer treatments make him weak. He did not say how long the piano had been in his possession, but he did play it a little for us. I was concerned a bit because we did not have an third party expert opinion there, but...well, Mr. Rosenfeld seemed like a man who likes fine things, knows his pianos, and did whatever it took to keep these pianos in pristine condition, and this one actually looked brand new. My husband, being the better judge of character than I am, felt that he was trustworthy and honest about the pianos he had. My husband is also the real haggler in the family, which did not use to be my thing, but I have since grown. Still my husband did not even start to bargain nor did I, probably because Mr. Rosenfeld kept coming down in price on his own even though he told us several times that we could sell it for more and that replacement value is around $70,000. He was not the type of person to sell a piano just to sell it. He really wanted that piano to go to someone like the Princess who would play it and he really wanted to see the Princess have that piano, which would have made me a bit suspicious usually and I thought it might be better to try other pianos to compare—although I know that usually leads to me being more indecisive—but I just felt at peace like God had led us there. In fact, when I asked my Lord in that moment, I thought I could hear angels singing as if all of heaven was saying, "Yes!" I just felt the Lord had provided and set this all up for us, for that particular piano, for that moment. And as if it was another sign that is was our piano in waiting for us, it was made in 2001, the Princess' birth year. When he first mentioned the Petrof on the phone, I looked up his listing on Craigslist. At the time he had it listed for $12,800, which I thought would have been a fair for-sale-by-owner price for a 2001 Petrof IV, when I look for comparisons on the Internet, but he changed the listing to $10,800, which was better. He talked himself down to $8,000 with delivery and threw in some free music he had in boxes, so the Princess would have music that would be familiar to the restaurant patrons, because he really was impressed with her. I wrote out the check on the account that would not cover it until Monday and told him I would call when the money was transferred and available. We quickly picked a few pieces of sheet music, but we realized that he was tiring, so we decided it was time to go. He promised to go through the music and send more along with the piano that would most likely be delivered on Wednesday. As we were leaving, he began telling us about five acres of property he had close to Reinhardt University with a waterfall of which he owned both sides. My husband said he would like to see it. The price was too high for us and just plain too high, but that will probably not be the final price, so...who knows? My husband is intrigued, but I was just thinking about the next step with the piano. On Monday, I called Steinway Piano Gallery to get some background on our Opus II that no one has ever heard of, since we bought it there, because we would like to list it for sale with some info on it. I talked to someone, not sure if he was a salesman, manager or owner, but he was rather helpful and informative. He told me that business had been sold since the original owners who made Opus II their house brand with focus on solid-made entry-level affordability. However—and this gets confusing so stay with me here—"Opus" was a trademark owned by Steinway, the American piano manufacturer, which has no ties with Steinway Piano Galleries, the store, other than the store sells Steinway pianos, as well as other brands. The owner of the trademark was not using it, but still owned it. I would think the "Steinway" in the store's name would be a bigger trademark issue. Opus pianos were only sold for a few years and then the name was changed to Cristofori, which is the name of the inventor of the piano. So, I actually have a Cristofori V430 French Cherry Console but with the Opus name. That was very helpful because even though this model is no longer made, at least I can find them on the Internet for comparative pricing. Somehow we went from there to why I was selling it and I explained that we had bought a Petrof grand. The man said he used to sell them. Since he was willing to share his piano knowledge, I learned something about our new piano too. I knew that Petrof had come under state ownership in 1948 and that some felt the quality was not consistent until it was reprivatized between 1991 and 1998, which made me happy that we have a 2001. However, he also explained something I did not know. Petrof pianos were less expensive, some even say under priced, possibly because Czechoslovakia changed from their own currency to the Euro in May 2004. Afterward, Petrofs when up in price. The IV is a now retired model, but to replace it with the same size Petrof piano, the P 173 Breeze, which has been improved some, looks like it would cost around $69,000 to $79,000. I have even seen an original retail list price of $79,000 on a 1998 P IV that was sold used for $17,999 recently at a piano store. Regardless of what it was or what it would cost to replace it or what others are selling for, I think it was worth what we paid for it and necessary for the Princess—there is just something more special about playing a grand. The man proceed to ask me where I had purchased the new one and I told him from a man in the Woodstock area. "Not Bob Rosenfield." I corrected him with "Rosenfeld" and asked why. Then he said he was not going to say anything on that, so then I was second guessing this purchase...and again the Lord was telling me all is well. 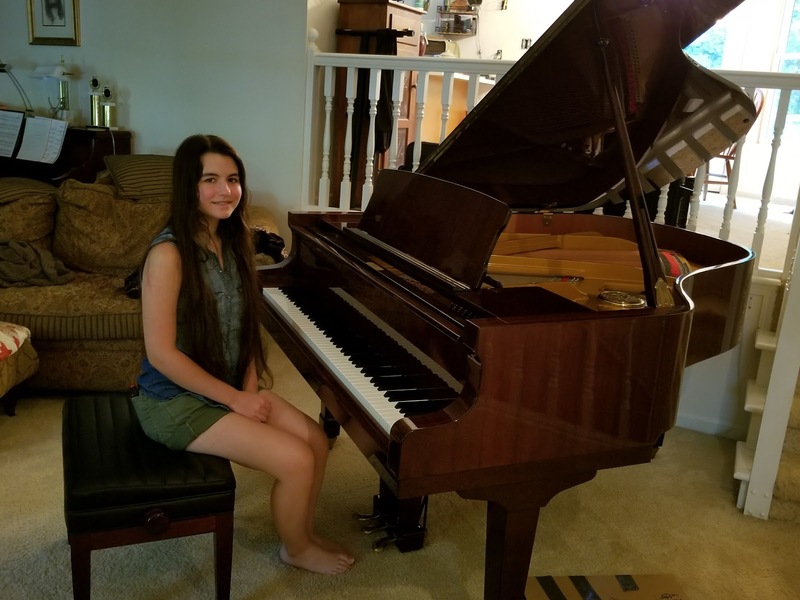 Having purchased the 2001 Petrof IV with delivery set on Wednesday, I began third guessing all of it, but when I would go to my Lord, I still felt that was our piano, actually my daughter's piano. We went to church on Sunday as everyone was feeling a bit better and that evening my husband flew out to work. I would be handling arranging the living and fitting in the very big piano into our shrinking living room. I looked up the dimensions again. It is just a tad under 5'8" (172 cm) long and around 5' (152cm) in length. Although generally thought of as a baby grand by many, it is kind of on the cusp, and others would say it is a parlor grand or medium grand or even just a grand. I began measuring our space and moving furniture on Monday, because the next day we had errands and I did not want to try to do it all last minute on Wednesday when I did not know when the delivery would be. There were only three places—corners of the room, really—where this would work, we had originally thought, but the measurements ruled one out immediately. Besides it would be in sunlight, but just in the earliest hour or two have the sun was over the horizon, thanks to our front porch, and we could have drawn the drapes at night. The second corner was where her Opus already was, which would have made it a bit too close to the fireplace that we do use in the winter. The upright does not have that problem as it is against the wall and not sticking out near the fireplace. So, by the process of elimination, the very best fit was in the corner near the steps going up to the dining room. The piano is would be the very first thing people will see when they walked into the door. We moved everything over towards the eliminated corners to give the piano movers as much room as we could to maneuver, so the following picture is before we rearranged the furniture. They arrived in the afternoon and they really needed a fourth man. Because of my lovely rock tiered garden in the front and the five steps up to the porch, it was not easy to line it up on the ramp and the ramp was too steep for just three men to push up a 750 pound piano. The Princess and I both gabbed a strap and pulled with them and we got it. I must say here, though, watching a piano being moved and set up is a harrowing affair, to say the least! I asked the piano mover, who is also the piano technician that Mr. Rosenfeld uses, how long he had known him, because Bob had told me already. Twenty years he has been tuning and moving his pianos. I then mentioned that I noticed Bob is rather particular about his pianos so he must be a rather good technician and mover. He agreed that Bob was particular. At that point, I thought that Mr. Rosenfeld has probably been trading and selling pianos for years and Steinway Piano Galleries sees him as competition. It is so amazing how that same piano looked so much smaller in those big spaces with other pianos around and now it looked huge taking about a fifth of my living room space! However, I decided I really like it where we decided to place it because divides the walkway from the front door to the dining room or to the living room and it pulls over the rest of the living room closer to the fireplace, without having to move the TV. It looks cozier but not too crowded that it is uncomfortable, at least for me. There is a bit of a problem: we also still have the Opus in the living room. So for now, my couch is angled between the two pianos so that one end is a bit behind the curved side of the Petrof and the other is in front of the Opus, not against the wall where I would prefer it and would be if the Opus was not there. However there is plenty of space to get round and, well...I like it. The grand is worth it. It is kind of funny, really. The digital piano is often set up in our dining room, so basically all three pianos are within about ten feet of each other right now. (My Roland keyboard is still downstairs.) But the funnier thing is...well, you will have to read the next post for that one. My Lord, thank you for this beautiful addition to our lives. My daughter plays it so well. You truly are a God of Wonders! Wow. Just wow.... You are brave. I remember what a drama it was buying Cait her very own flute because we were totally clueless & there were dramas...It looks so lovely & the Princess looks so happy.